To calculate the radius of a geostationary orbit, the centripetal force must equal the gravitational force on the satellite or mass..
We know that (m2) is the mass of the earth at 5.98×10^24 kg, T is the time period and G the universal gravitation constant at 6.67 x10^-11 kg^-2 . However this is the radius to from the center of the Earth. Therefore, we will need to deduct the radius of the Earth from this number: the height of the satellite from Earth = r – r(E) where r is the distance of the satellite from the center of the Earth and r(E) is the radius of the Earth. 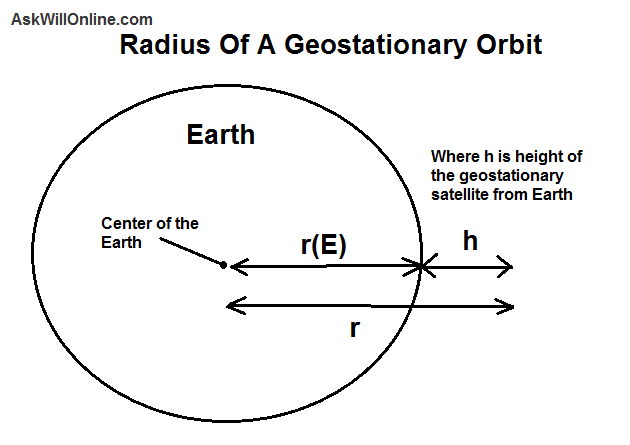 From this, the radius of a geostationary orbit for the earth is 3.6×10^7 meters. 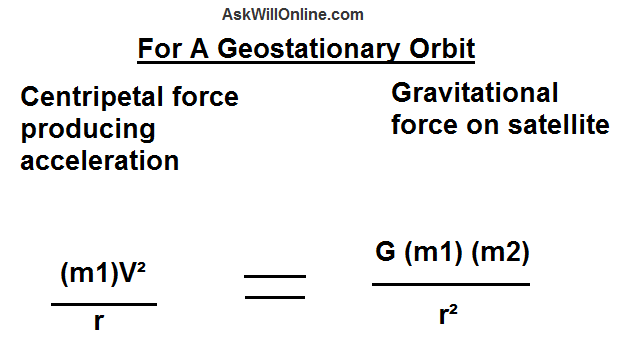 A geostationary orbit is an orbit which is fixed in respect to a position on the Earth. Therefore, the time period will always be 24 hours. From combining the centripetal force, gravitational force and basic velocity force equations, we can deduce that the radius required for a geostationary orbit is 3.6×10^7 meters.